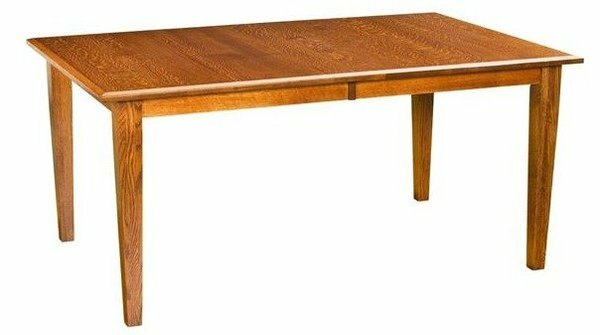 The tapered legs of the Amish Shaker Mission Dining Table contribute to its strong form and function. There are no frills here, just a stunning solid wood table full of function and rich with the solid wood you select. This dining table is completely customizable and Amish craftsmanship ensures this dining table will last for decades. The simpler the better, a likely motto for shaker style furniture, doesn't mean this furniture won't stand out. This wood dining table is ready for every occasion your household needs to host from big to small. If this is your first time ordering furniture online, we understand it can be a big leap of faith. See what customers are saying about our furniture on our Reviews page and view photos of the DutchCrafters furniture in their homes. We can't wait for you to experience new Amish made furniture! Please email or call us with any questions and thank you for shopping at DutchCrafters. Height: 30", 36" or 42"